On July 20, 2017 22:31 UTC, a strong Mw = 6.6 earthquake occurred at shallow depth between Kos Island (Greece) and Bodrum (Turkey). We derive a co-seismic fault model from joint inversion of geodetic data (GNSS and InSAR) assuming that the earthquake can be modelled by the slip of a rectangular fault buried in an elastic and homogeneous half-space. The GNSS observations constrain well most of the model parameters but do not permit to discriminate between south- and north-dipping planes. However, the interferograms, produced from C-band ESA Sentinel 1 data, give a clear preference to the north-dipping plane. We also map surface motion away from the satellite along the Turkish coast (from Bodrum towards the east) which reached about 17 cm onshore islet Karaada. The best-fit model is obtained with a 37° north-dipping, N283°E striking normal fault, in agreement with the published moment tensor solutions. The resolved slip vector is dominantly normal with a slight component of left-lateral motion (15°). The surface projection of the seismic fault outcrops in the Gökova ridge area, a well-developed bathymetric feature inside the western Gulf of Gökova. Our geodetic model fits the pattern of the shallow, north-dipping aftershocks obtained from rigorous relocation of all available recordings in the region (about 1120 events; relocated mainshock is at 36.955°N, 27.448°E; depth at 9.2 km ± 0.5 km). The relocated aftershocks also indicate clustering at both ends of the rupture and seismicity triggering mainly towards the east and the north, within 2 weeks following the mainshock. 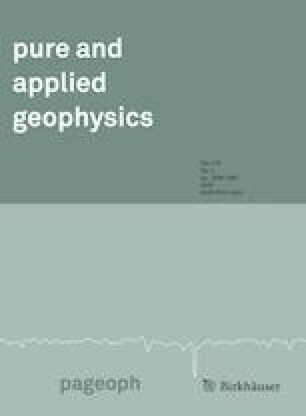 We also analysed regional GPS data (interseismic velocities) and obtained an extension rate of 3.2 mm/yr across the Gökova rift, along a direction N165°E. The online version of this article ( https://doi.org/10.1007/s00024-019-02154-y) contains supplementary material, which is available to authorized users. We are indebted to two anonymous reviewers for their constructive reviews. We thank the NOA, EMSC, KOERI & DDA analysis groups for the provision of seismic data. Sentinel 1A images were provided free by ESA’s Sentinels Scientific Data Hub. Focal mechanism data were accessed from http://bbnet.gein.noa.gr/HL/, http://www.globalcmt.org/, http://www.geophysics.geol.uoa.gr/ Bathymetry data were retrieved from EMODNET and topography from ALOS global model (30-m). We thank Ahmed Yalçıner, Evi Nomikou, I. Parcharidis, M. Sachpazi, R. Reilinger, S. Ergintav, T. Taymaz, G. Papadopoulos and E. Lekkas for comments and discussions. We thank the HEPOS network (Greece) for providing GNSS data from their stations in Kos and Rhodes. We also thank the Greek private networks, METRICANET http://www.metricanet.gr/ and URANUS (TREE Co, http://www.uranus.gr/) and the Turkish GCM network for releasing their GNSS data. Coulomb Stress Transfer was calculated by the Coulomb v3.3 software (Toda et al. 2011). Several figures were prepared by use of GMT software (Wessel et al. 2013). P. Argyrakis acknowledges the Stavros Niarchos Foundation for its support. We acknowledge funding of this research by the project ‘‘HELPOS—Hellenic System for Lithosphere Monitoring’’ (MIS 5002697). Basili, R., Kastelic V., Demircioglu M. B., Garcia Moreno D., Nemser E. S., Petricca P., Sboras S. P., Besana-Ostman G. M., Cabral J., Camelbeeck T., Caputo R., Danciu L., Domac H., Fonseca J., García-Mayordomo J., Giardini D., Glavatovic B., Gulen L., Ince Y., Pavlides S., Sesetyan K., Tarabusi G., Tiberti M. M., Utkucu M., Valensise G., Vanneste K., Vilanova S., Wössner J. (2013). The European Database of Seismogenic Faults (EDSF) compiled in the framework of the Project SHARE. http://diss.rm.ingv.it/share-edsf/, https://doi.org/10.6092/ingv.it-share-edsf. Papanikolaou, D. J., & L. H. Royden (2007). Disruption of the Hellenic arc: Late Miocene extensional detachment faults and steep Pliocene-Quaternary normal faults—Or what happened at Corinth? Tectonics, 26, TC5003, https://doi.org/10.1029/2006tc002007. Saltogianni, V., Taymaz, T., Yolsal-Cevikbilen, S., Eken, T., Gianniou, M., Ocalan, T., et al. (2017). Fault-model of the 2017 Kos-Bodrum (east Aegean Sea) Mw 6.6 earthquake from inversion of seismological and GPS data—Preliminary Report. EMSC. http://www.emsc-csem.org.